Wash, dry, and chop your potatoes into small chunks. I leave on my skin, since it has so many great vitamins and stuff inside. Decide for yourself what you want to do about those skins. Place potatoes in your pressure cooker with about 4-5 cups of water. I like to always do a bit more. Air on the side of caution, where pressure cookers are concerned. Once your pressure valve begins to rock, let it cook for about 15 minutes. Cool rapidly in your sink. (Here is how). Once your pressure cooker has cooled, place potatoes in a bowl. Add about 2 tablespoons of butter, cheese, and 1/2 cup sour cream. Beat by hand, with a hand mixer, or with your Kitchenaid mixer. I like mine to get nice and creamy. I season all my potatoes with a little bit of Lawry's Seasoning Salt and Garlic Salt. This is all done to taste. We like a little bit more garlic than most folks. If my potatoes need to be thinned, I add a few splashes of milk. These are super easy to make and oh so yummy. We love to pair our mashed potatoes with BBQ chicken sandwiches, Oven-Fried Chicken Legs, Sloppy Joes, BBQ Hamburgers, and Hawaiian Roll Ham Sandwiches. Find more recipes for the pressure cooker HERE. Learn how to use a pressure cooker HERE. Your posts, about pressure cooking, have made me want to buy a cooker and give it a try! Thanks! 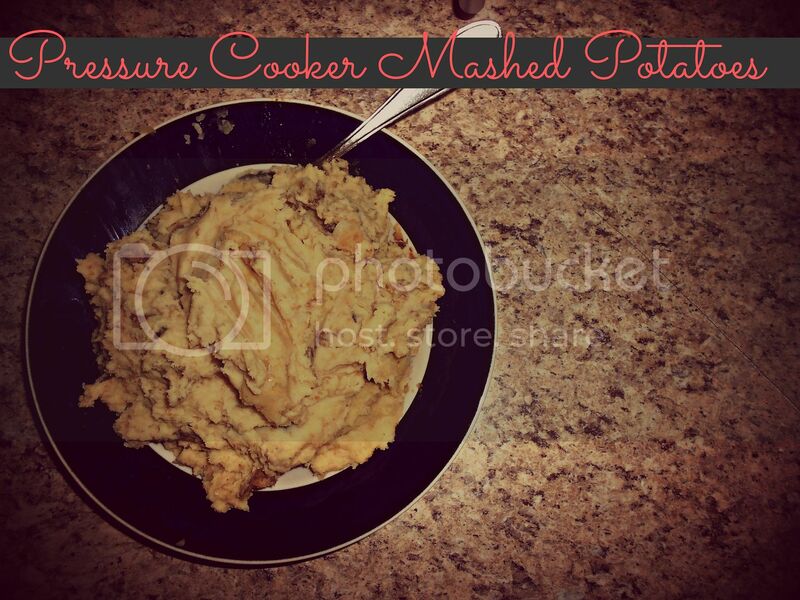 Pressure cookers are the best for making mashed potatoes! I actually cook mine whole for about 12 minutes after adding enough liquid to cover potatoes halfway. Once they are cooked let them cool enough to handle and you can slide a fork over them and peels come right off...if you want them off. Save the cooking liquid and you can add some to the potatoes to thin them out more if you want a lighter potato. We usually like the sour cream and cheese on them like you though. Lol! Cooking tip from chef, given to me: cook potato's whole, peel on or off (myself I lourve me some dirty smashed taters, that's washed but the peel left on). After draining off water put back into hot pot and sit on hot burner just a few minutes, see all that steam? It's drying the potato's and they will taste better and not waterlogged. Like store bought potato salad ( which I think should be outlawed ) this gives them a better taste (INHO) and then if you run them through a ricer or just smash very well then no lumps! But my weird family like the lumps too so I just smash by hand. I am love love loving!!!! this blog. Been sneaking around here for a few months. I have shared you with my SIL and she is loving you too! We also are pressure cooker fans!